DQ*Plus makes it easy to cleanse data and consolidate duplicate records in Salesforce.com. 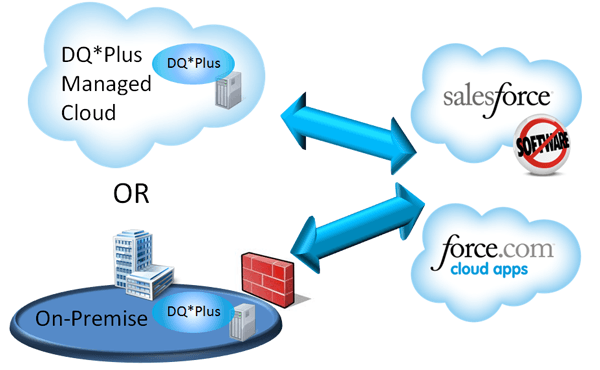 The DQ*Plus Salesforce.com Connector eliminates integration work and enables logic that is more powerful by providing easy access to all Salesforce.com data. DQ*Plus allows you to define business rules using combinations of Objects and fields. DQ*Plus Interactive provides features that are embedded in the Salesforce.com user interface. As users search for or enter data, DQ*Plus interacts with the user to prevent the entry of inaccurate data and duplicate records. Finding records that would have otherwise not been found and finding them quickly, combined with fewer keystrokes for entering data results in significant time savings. Sales teams are more effective because the time saved is spent selling. To learn how DQ*Plus can quickly improve the return on your Salesforce.com investment call (925) 913-4593 or send email.